It seems quite appropriate to be writing this article on this particular day; November 23, the 86th anniversary of Sri Sathya Sai Baba’s descent into flesh. Devotees all over the world will be celebrating today but I’m going to tell you about an incident that occurred on Saturday 19 November in Cheltenham, when The Sai Organisation UK Region 7 held a regional birthday celebration in honour of our beloved Sai. I must say that when I first heard it was to be held in Cheltenham this year I was a bit dubious to say the least. I have never liked Cheltenham; it is a smallish town but very, very busy. Traffic is quite often gridlocked and the town centre road network is not exactly driver friendly, especially if you don’t know where you are going. Yes, I still have memories of being lost in Cheltenham on a number of occasions and driving around aimlessly getting more and more frustrated. But I wasn’t going to let a little thing like that stop me from paying my respects to Swami. I set off nice and early to take into account that I was, in all likelihood, going to get lost. Surprise, surprise I reached my destination without any hitch and I arrived at The Cheltenham Hindu Community Centre in plenty of time. There is always food laid on at these events and it never fails to amaze me just how sumptuous it is. All of Cheltenham Sai Group worked tremendously hard in organizing the event, but the ladies who prepared the food must take a special pat on the back. As ever, it was basic vegetarian fayre, but unbelievably good. The chick pea curry was mouth-watering and the Indian sweets were out of this world. Lunch was actually the first thing on the agenda before the celebrations started at 2:00 p.m. The event kicked off with a wonderful little play by the kids from Swindon Sathya Sai Education Group, and there followed a lovely video “Love In Action” that highlighted Swami’s fresh drinking water, hospital and educational projects (unfortunately, the video had to be cut short due to time restrictions). As the devotional singing and the event in general was drawing to a close an elderly lady in a wheelchair had a cardiac arrest. Fortunately, there was a couple of GP’s present and also a couple of nurses. But I found what followed so surreal. The lady was very quickly lifted from her wheelchair and placed on the floor, where she immediately received CPM from a male nurse. He moved so fast it was quite unbelievable. Whilst the doctors and nurses attended to the lady someone called for an ambulance. A makeshift screen was then formed by a number of other ladies using sheets; this gave a degree of privacy to the patient and helped to maintain her dignity. Almost simultaneously most of the people not involved started to chant the Gayatri mantra. I always feel so completely and utterly helpless in these situations but joined in the chanting. It must have taken the paramedics at least 15 minutes to arrive, and it must have been very strange for them as they entered the hall with so many people chanting whilst a patient was receiving life saving first aid on the floor. I remember thinking to myself as the drama began to unfold “what a way to go”. It seemed that Swami had decided to take her, bathed in his Omnipresence, in an environment that she loved amongst other devotees, having just finished celebrating her Lords glory; I was convinced she was gone. However, after a short time had lapsed we received a signal that the lady was going to be alright, and all those engaged in the chanting instinctively brought it to a close. The paramedics took the lady to hospital and one of the attending GP’s made an announcement. The female GP told us that the lady had indeed suffered a cardiac arrest. She also informed us that the lady had stopped breathing and that she had turned black. So we can conclude that the elderly lady had indeed “died”. My friend Satyan from Bath, knowing that I didn’t particularly like driving in Cheltenham, called me later that night to make sure I’d arrived home in one piece. He’d had a lift from the male nurse who’d performed the CPM. During the drive back the man told Satyan that the lady would not have survived had they waited for the paramedics, so it just goes to show that it was not the lady’s time to go and Baba, from his cosmic residence, had somehow engineered the whole event as if it was nothing more than a scene from a play. I have been to many of these functions now and never experienced anything like it before, so the drive home was very strange indeed; with everything swimming around in my head. Now, five days later, I am still trying to get my head around the events of last Saturday; events that I found very surreal indeed. Surreal for me maybe, but it was just another day at the office for the birthday boy! 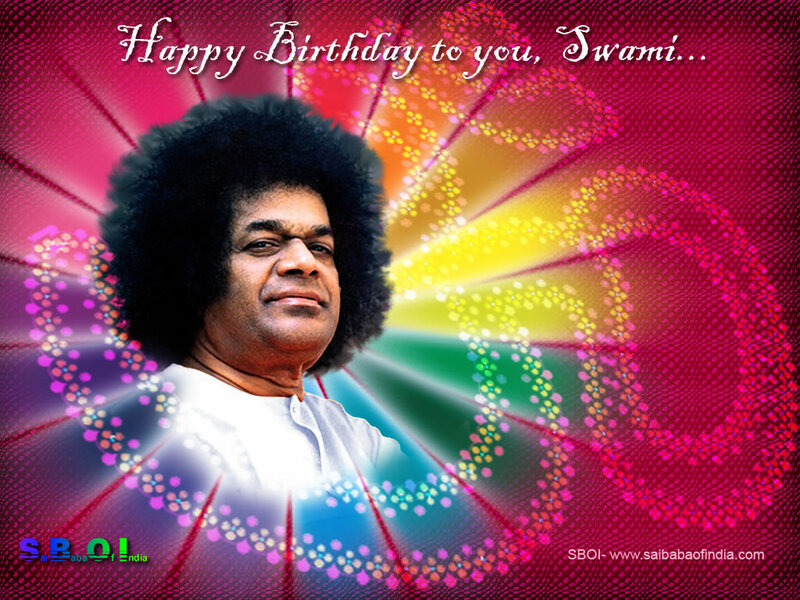 This entry was posted in From The Heart and tagged God in human form, Miracle, Omnipresence, Sai Baba, Sai Baba's Birthday, Sathya Sai Baba, spirituality by Bloggin With Rich. Bookmark the permalink.